The Aeroneb Go sets a new standard for home nebulizer therapy using the OnQ® Aerosol Generator, the same trusted technology used in hospitals worldwide. 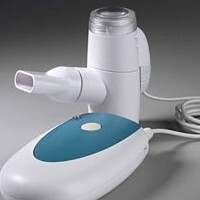 The unique micropump technology operates silently while delivering respiratory medications rapidly with a minimum of waste. The Aeroneb Go is very intuitive to use and easy to clean. 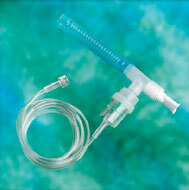 The MICRO MIST small volume nebulizer is designed for performance and economy. It can be used for hand-held or in-line treatments. Adult and pediatric size masks are available. Consistent performance at angles up to 90º allowing clinicians to administer medication to patients positioned horizontally or with special treatment requirements. Easy-seal, threaded cap and 6cc capacity anti-spill jar to prevent leakage. Pedi-Neb pacifier calms an infant or toddler during an aerosol treatment, as the medication is inhaled through the nose. The Pedi-Neb with VixOne nebulizer is ideal for a toddler to hold while receiving an aerosol treatment.